The smart phone generation brought about an era of easier communication, Google at your fingertips and endless things to watch. What it also brought on was a device that some adults did not fully understand. 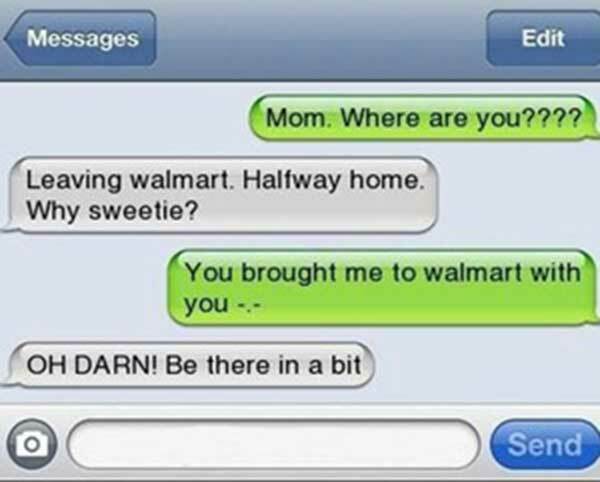 The result of this lack of technological savvy is never ending hilarious text messages from parents to their kids that are a mix of autocorrect fails, silly questions and scenarios, as well as some advanced parents who do know how to use their smart phones but do so at the expense of their children. 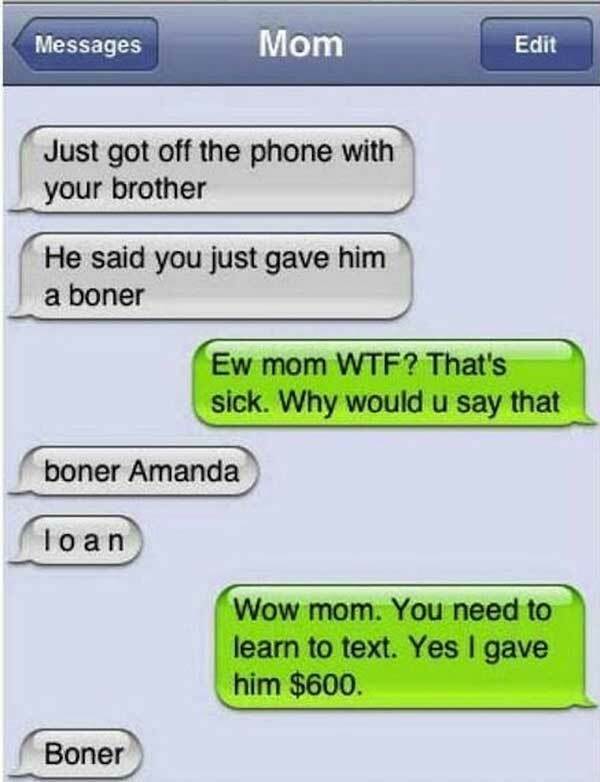 Some of these parents are so behind in the times that they aren’t aware of what certain acronyms mean, which could be a very serious faux pas on behalf of the parent during texting with their kids. 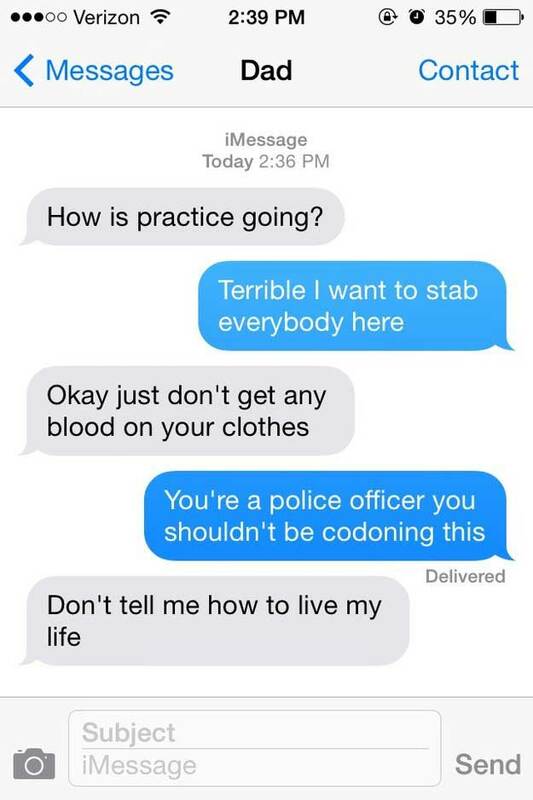 These are some of the funniest text messages parents sent their kids. Reading through them is sure to induce laughter, crying, urinating of pants and all around good feelings. Many of these made us say – OH MOM! for the lack of knowledge or better editing of the parents message. Soon enough we are all going to be masters of the texting world, it just takes our parents a little longer to catch up to us. “Wait a minute, I’m just going into a tunnel. There is no reception, can’t hear you, you’re disconnecting”. We’re all too familiar with this excuse and probably used it at some point. This is a slightly different case. Whether this was a joke or not on behalf of the parent, this kid was NOT amused. Perhaps this mother didn’t realize that writing that you have a bad connection rather than saying it over a call makes for two different reactions and levels of believability. There is something about mothers and photo taking on smartphones that seems to be amiss. Here we see a perfect example of a mother trying to share her beautiful day with her kid by sending photos of her location. The only problem is that she isn’t aware that her finger is obstructing the lens. What’s worse is that when she is aware she still doesn’t know how to fix the situation! Emojis are a relatively new thing. You add the little face or image in your texting to make a point or show expression (especially since there is no intonation when texting). Here we are privy to a classic emoji mix up situation. 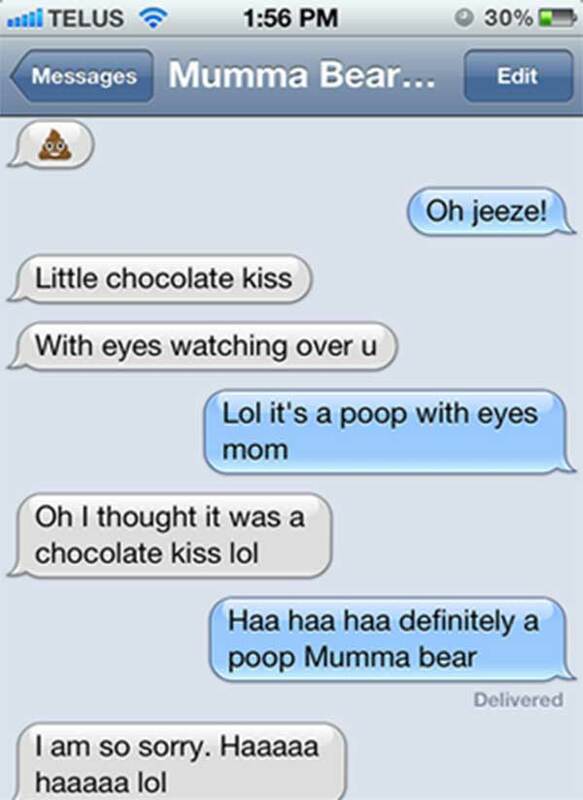 This mother thinks the little poop emoji is actually a Hershey kiss! While we do see the resemblance between the two figures, the first thought for a millennial would be that the emoji is poop and not a chocolate kiss. Mom is much more innocent. Every mother wants her daughter to find a significant other she could share her life with that will treat her well and be an addition to the family. This mother took it much farther with a text to her daughter that included a boyfriend that has yet to be had by her daughter. We guess this is better than the mother actually going out and seeking a boyfriend for her daughter, that is SO Hollywood! Also, a scarring experience for the daughter for sure. There are a few ways you can understand someone who is telling you they are coming out. Here we see a classic situation where the parents of this boy think he is coming out of the closet rather than coming out to visit them for the weekend. There’s a thing about dad’s – they always think they are funny when they are just plain creepy. Here we are exposed to an unsettling conversation between a father and his kid. Dad is trying to be funny by answering questions in a literal form but is just making his kid more and more annoyed as the conversation is going on. Dad – don’t try and be funny, just be you! This is the classic case of pushy Jewish mother. The stereotype is there for a reason – they meddle. 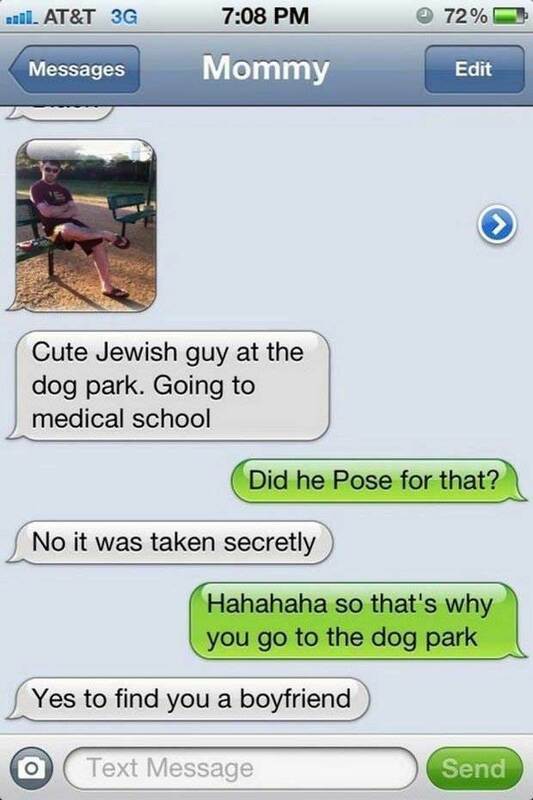 Here is a classic example of a Jewish mother texting her daughter about a man she found at the dog park, a place she goes to for the sole purpose of finding her daughter a boyfriend. Luckily for this mom, her daughter is taking her stalking for men skills with a grain of salt and thinks its all too funny. The older generation has a problem with technology, that’s no secret. Here we see an example of the issue. Kid: ‘So how’s your new phone? You finally have a smartphone 😀 Mom? 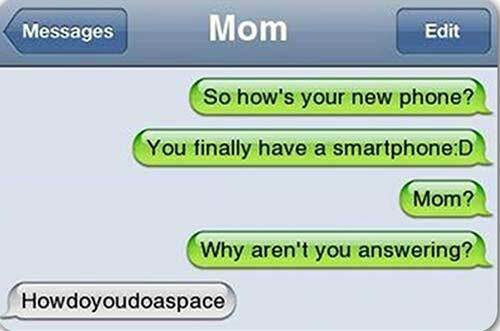 Why aren’t you answering?’ to which the mother replies: ‘Howdoyoudoasapce’. 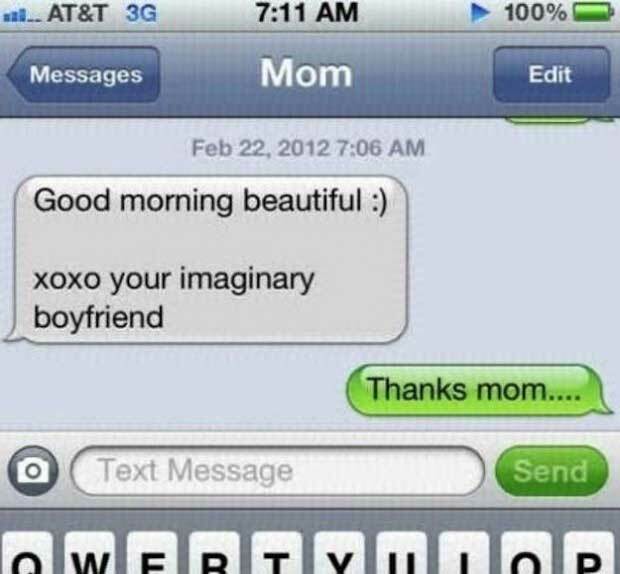 This one made us laugh out loud for a solid minute, we are sure the kid who got this message was either face palming him or her self or in total disbelief at their mother. This mom decided to play a pretty neat (albeit scary) trick on her child. We know that if it were us, we would be totally freaked out sitting in a closet thinking that there is an intruder in our home. This mother decided to play on her child’s fear and freak him or her out. We can only take a guess that this is payback for the kid acting out or coming home late or something, otherwise this is just plain mean. Young ones have a tendency to blow things out of proportion and use a lot of OMG in their texts. 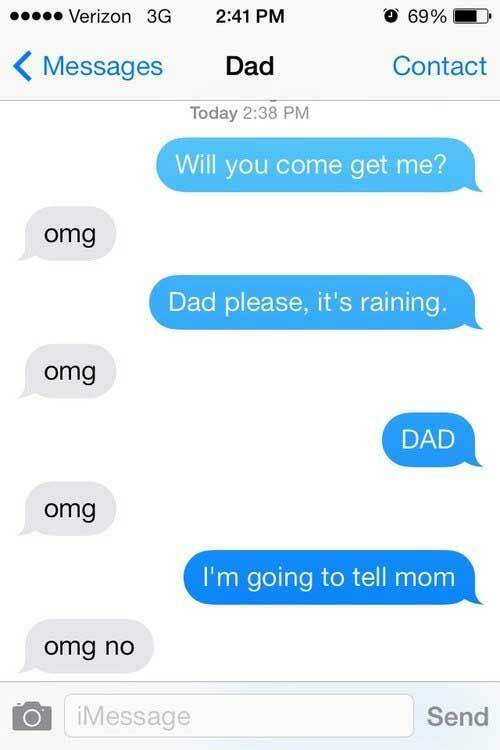 This dad decided to give his child a taste of their own medicine by answering every text his kid sent to him with an OMG. We would be annoyed too! 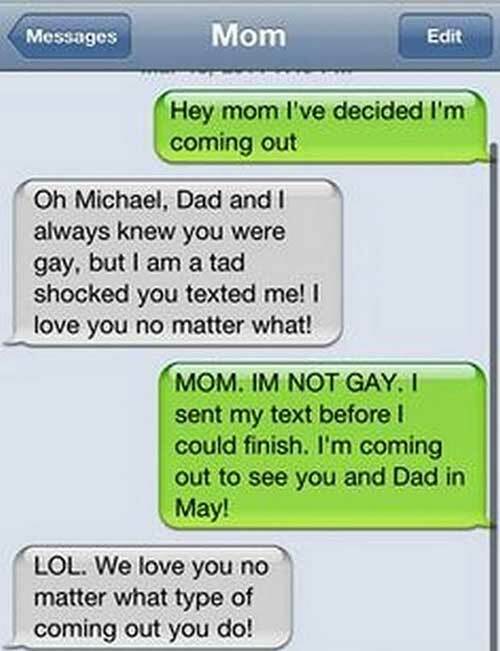 However, as soon as the kid mentioned his mother, dad got scared and added a ‘no’ to the last OMG statement. So you know how when someone calls you but you don’t want or can’t speak to them in that moment and you can send an automated message as you deny the call? Well, this dad has that feature on his phone and seems to do that to his child all the time. 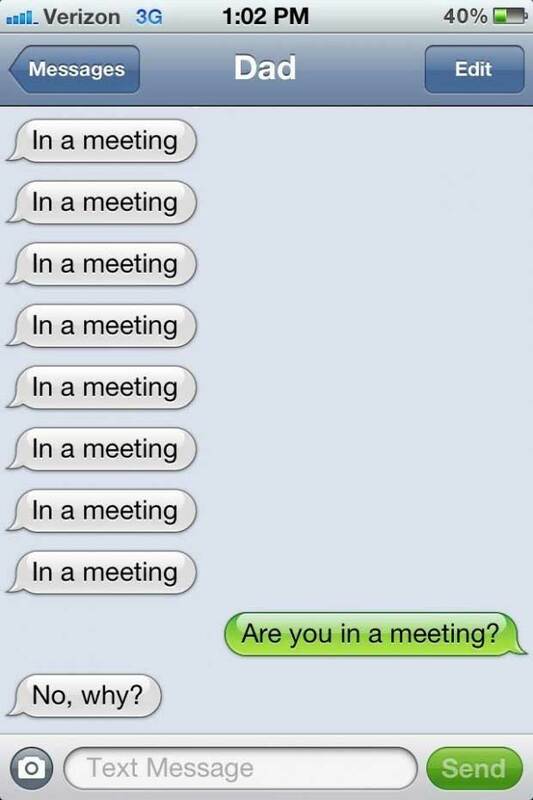 Then, when the kid goes to ask his father if he is actually in a meeting, he goes ‘No, why?’, which leads us to believe that he had no idea that he was sending those texts! When texting, it is common to use acronyms to make your text shorter and more to the point. So we have LOL – laugh out loud, ILU – I love you, TTYL – talk to you later, and IDK – I don’t know, to name a few. There are others that are less than appropriate as well, which we will not divulge here. This mom didn’t understand her child trying to answer her very question due to the fact that the answer sounded like something else! 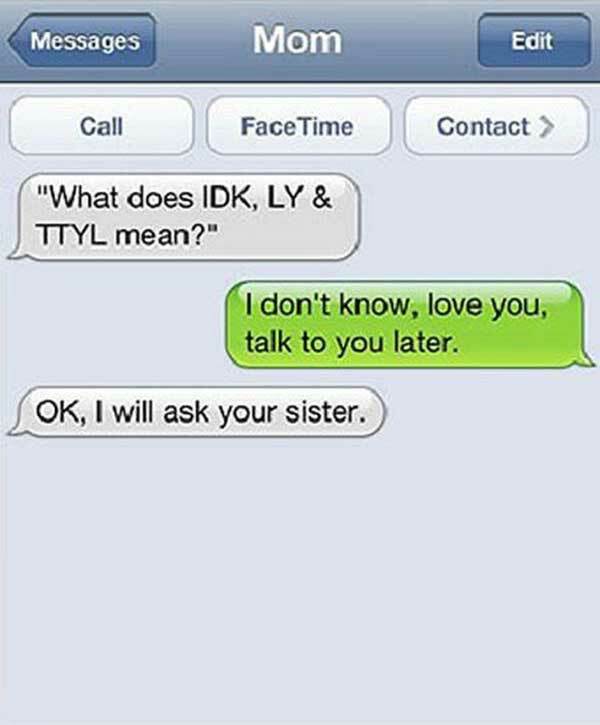 IDK, LY and TTYL are exactly what the kid wrote out as an answer and response to their mother. She didn’t get it. LOL means laughing out loud. This mom thought it meant lot of love. What a crucial mistake on her end when delivering the news that someone in the family had passed away. This is when technology and acronyms can get you in some serious trouble. 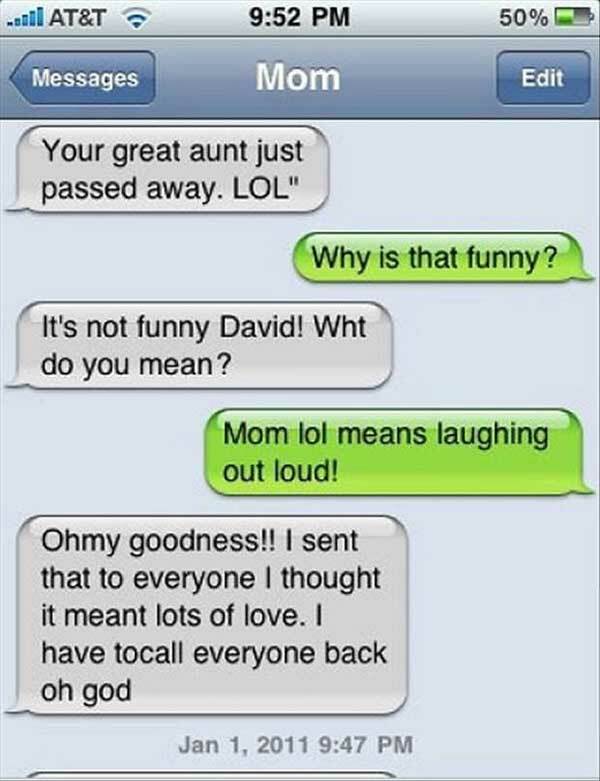 Now this poor mom has to call everyone she sent the message to and explain that she not only didn’t know what LOL meant but that the great aunt really did pass away. Middle child syndrome is a thing – the middle child always feels left out, un-special, caught in the middle and just plain ignored. Sadly, this is actually a thing these days. Many parents don’t take their middle child’s issues about being a middle child too seriously, as does this mother. 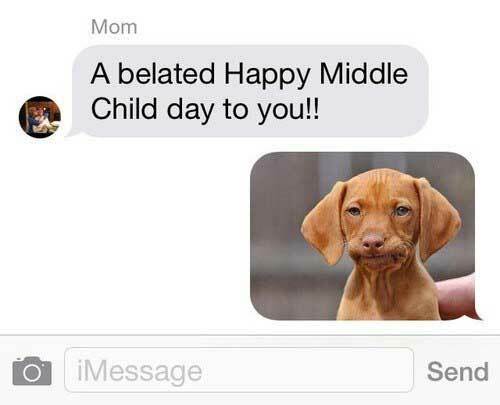 ‘A belated Happy Middle Child day to you! !’ is what she sent her on what must have been a day commemorating middle children. Their reaction to the comment? An adorable dog’s face seemingly unmoved. 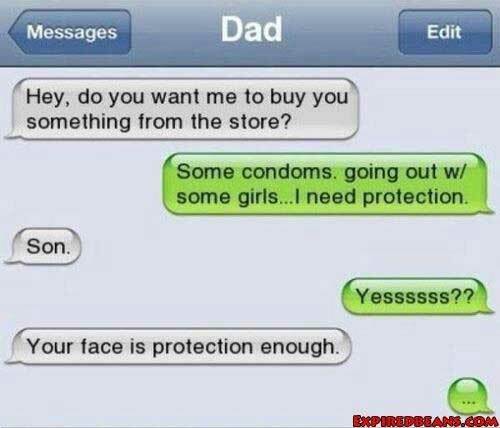 This dad is cool. We like him. Their kid, probably a girl because lets face it, boys aren’t afraid of moths, saw a moth outside of the bathroom door and asked her father to get rid of it. A moth, not even a bee or cockroach. 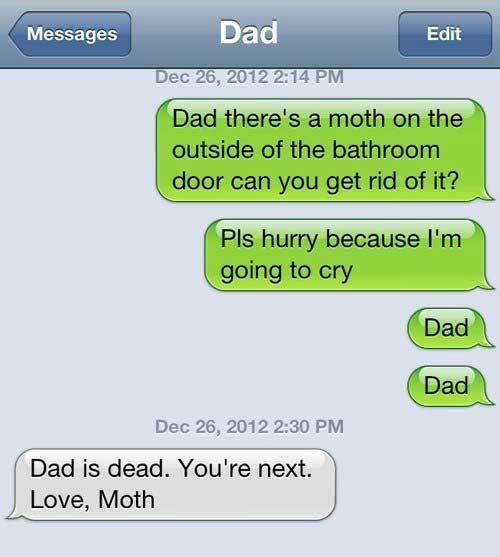 Dad decided to be clever and respond as the moth. We love his creativity and his way of saying – deal with your own problems, it’s a darn moth! 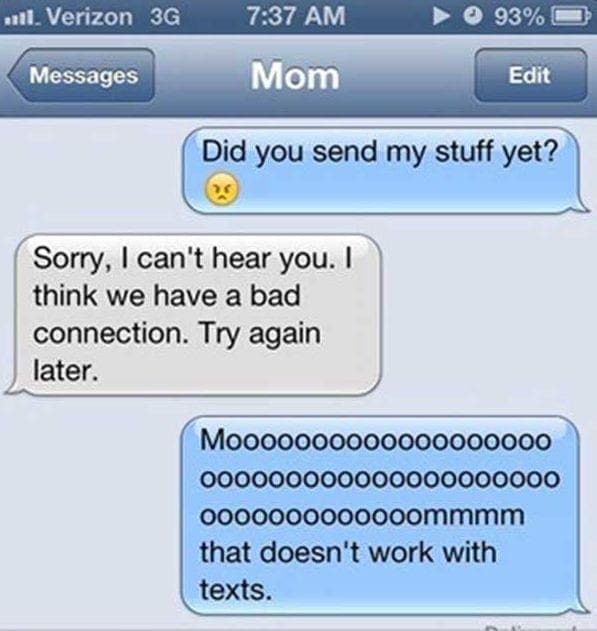 You want to know the best way to get your child to answer your text message? Write them that you’re getting them something they have always wanted, like a car. This, we have to say, is a brilliant yet evil move on behalf of the mother, you have to admit that it’s effective – the kid did answer! Mothers love to discover a new way to make sure their kids get their chores and work done, texting is a whole new way to delivering that message. This is a case of a dad who didn’t realize what he was doing until it was after the fact. His child left their phone at home and left the house, the father then noticed and proceeded to text the child that they left their phone at home WHILE THE PHONE IS AT HOME! Oh how parents sometimes don’t understand how things work. Adorable little mishap we have here. 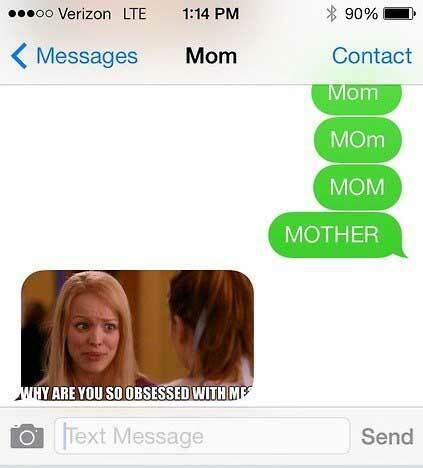 This mother has got to be the coolest mom on the face of the earth for using a Mean Girls meme to answer her daughter’s many text messages. For those of you who haven’t seen Mean Girls, watch it. For those of you who have, seeing Regina George in this meme, we can literally hear her saying – Why are you so obsessed with me? as she explains to Cady that her friend used to be her best friend and was too obsessed with her, according to her. Prego means pregnant. Prego is also a brand of tomato sauce found in your local grocery store. This dad got those two confused, making his child scarred for life. Kid: “Mom wants you to get her prego”, dad: “Well, I can’t. I had that problem solved years ago”, kid: “OH MY GOD DAD!!! EW! TMI! I will forever be grossed out. Mom wants you to get her PREGO! 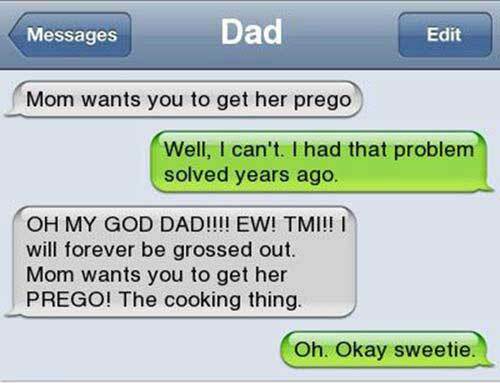 The cooking thing.”, dad: “Oh. Okay sweetie”. Classic. This kid’s dad is a police officer who knows he has a good kid so he isn’t worried when he gets a text from his son stating that he wants to stab everyone at his sports practice. The kid, though, is concerned about how little his father cares about his violent words. This dad is super chill about everything and responds to his child the way we would expect the child to be talking to the parent. Autocorrect is the devil, we all know that. It likes to change up our words way too much and it seems to do so in the most hilarious ways possible. 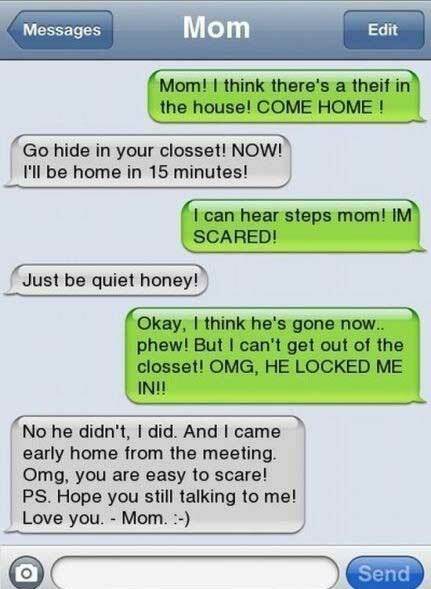 This mother child conversation is one for the books and was sure to make this kid want to move out if they haven’t already. Autocorrect changed Swiffer, the mop, to stiffy. We doubt we need to explain to you what a stiffy means. When your mom sends a text but doesn’t get anything in response she thinks something is wrong with her phone rather than other people not wanting to respond to her message. This kid made sure that their mom knew that the messages were going through by answering her message. Sadly, the mom didn’t get it. She got the message from her kid responding to her question about her messages and yet responded with another question. Oh mom. Autocorrect once again proves to be the reason for the funniest of text messages. All this mother wanted was to help her kid with some ripped clothing, and all the kid wanted was to reply to their mother that she did it already. 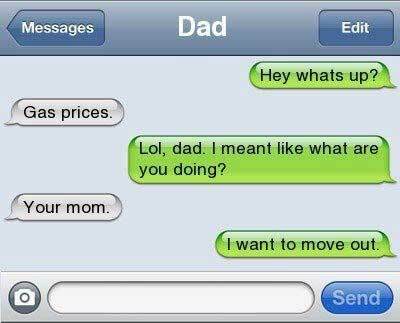 Autocorrect had a different plan – change the kids words to something a lot more embarrassing. Mom took it in stride, though, responding in a cool calm and collected manner. This dad gave his son his two cents about being safe, all the while insulting his son in the most hilarious way. We don’t know what this kid looks like but his dad made it pretty obvious that he wasn’t that much of a looker considering he said that he didn’t need a condom to be safe with a girl, his face is protection enough from any girl coming in his direction. Aw! 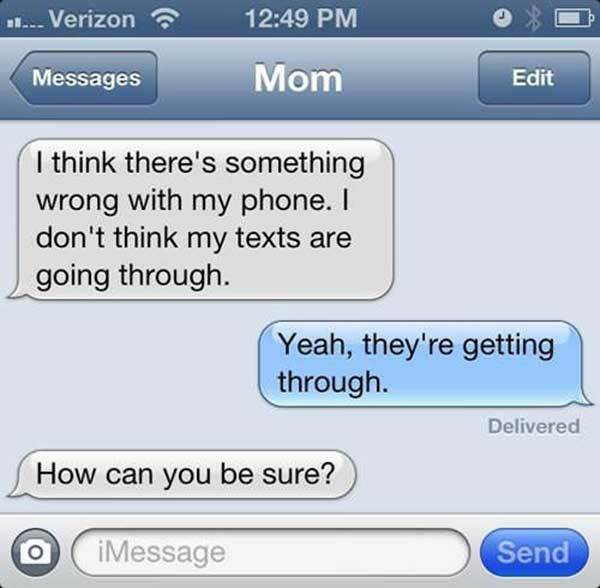 This mom made her kid feel so much better thanks to a misused word in their text conversation. Instead of Vicks, the vapor rub that we all know and love when we can’t breath well, the mother’s phone corrected her to another word. The kid had a good laugh (as did we) out of the whole situation, making her feel much better already, no medication needed in the end! Mom, you left me at the store. You forgot me. How dare you. 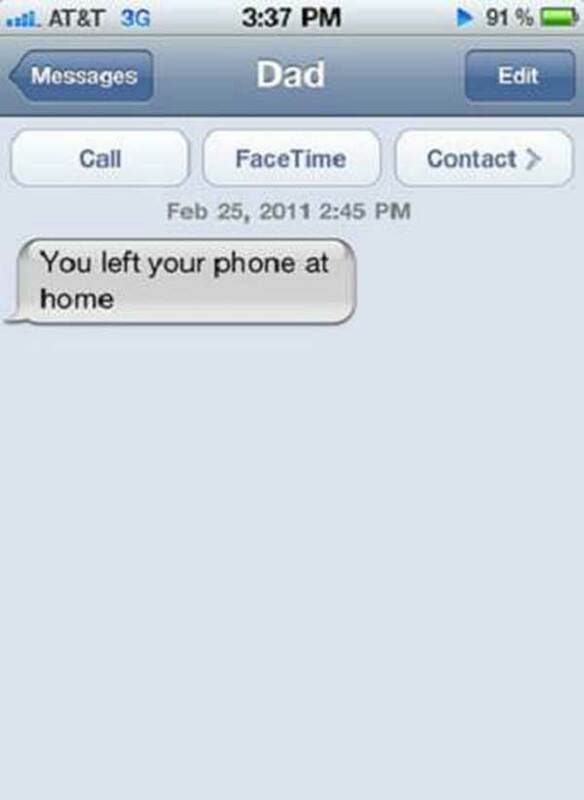 This is what the kid was essentially saying to their mother when they texted to see where she was. This mom must have been very distracted to leave her child at the local Walmart, although we hear stories like these all the time around the country. This kid got some serious trauma to deal with and will have a lifetime of guilt giving to their mother. Win! Parents usually shield their children from their adult behavior, especially when it comes to how their children were made. However, this dad was all but blunt with his child about not coming home to give mom and dad some time to be together. 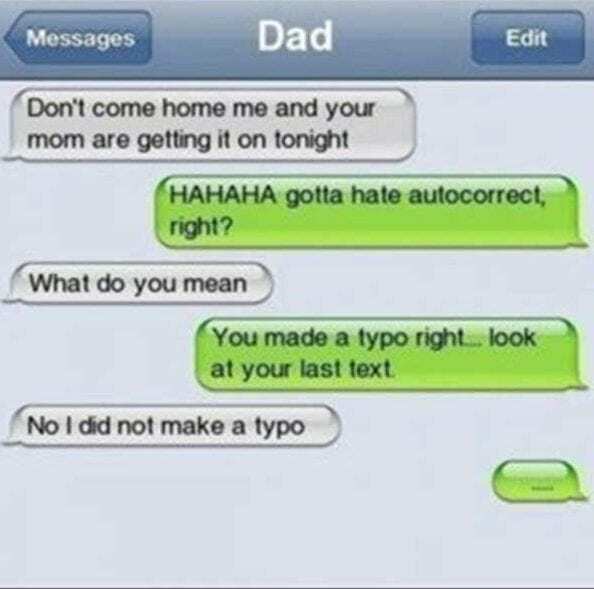 The kid thought his dad had an autocorrect fail when in fact the dad was just super honest about what his plans were for the evening. We all have those times when we can’t sleep so we do something like late night cooking, reading, or television watching. This dad had just that kind of night and offered some late night cooking results for his kid who was not having it. 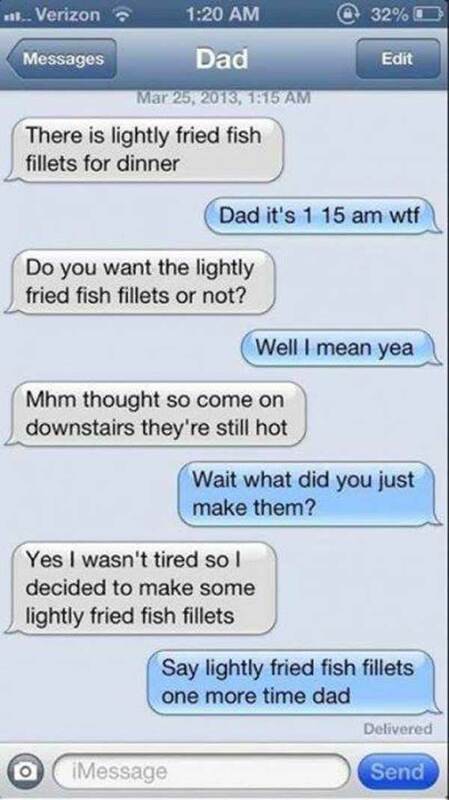 This text conversation states the words lightly fried fish way too many times for comfort and the kid notes it! However, we bet he did go eat some. 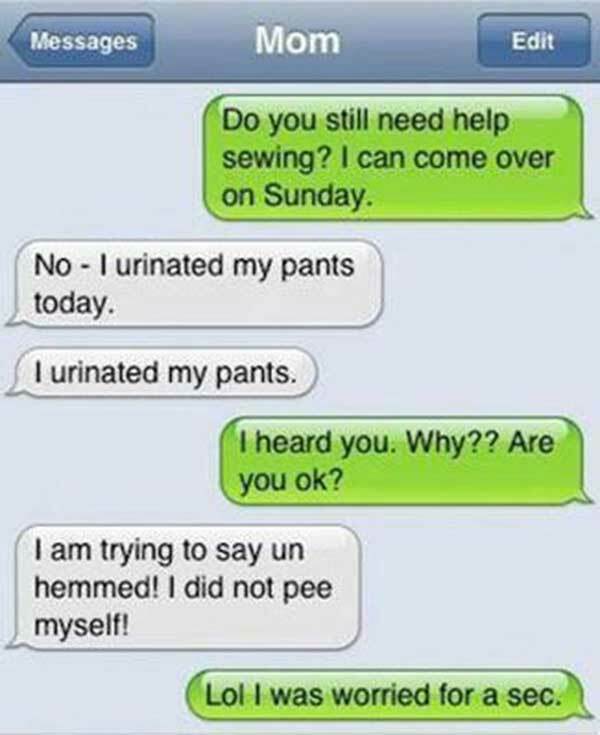 This mother daughter conversation took a turn when mom’s phone decided to autocorrect in a VERY inappropriate way. From the word ‘loan’ the phone decided to change it to something else. We don’t understand the connection between the two and how the phone thought it would be a similar word or the one that was meant to be used, but the kid was not cool with the inappropriate conversation. Like we said earlier, acronyms are a great way to text in a short and concise manner. 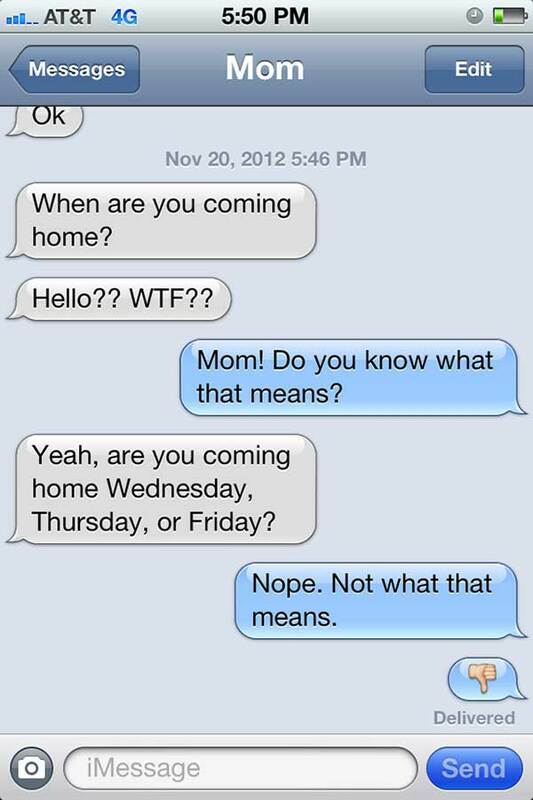 This mom, however, thought WTF meant Wednesday, Thursday or Friday. The real meaning of WTF we will leave you to find out for yourself if you don’t know it already, but it is less than appropriate. 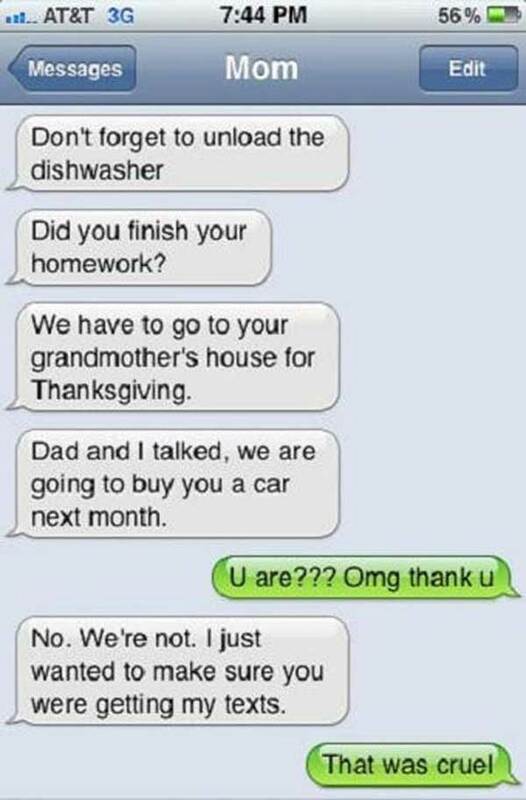 This kid lets their mom know exactly how they feel about the misuse. 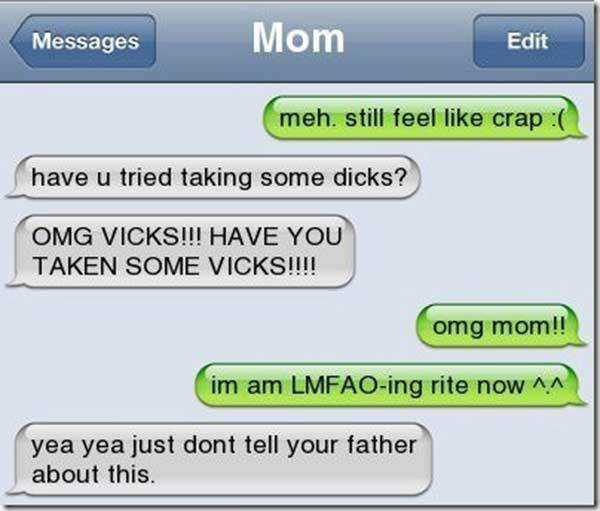 Poor mom didn’t know!